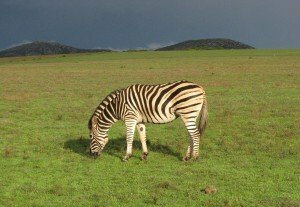 Part of the must-do experience in Africa is to go on safari and see wild animals, especially the Big Five; that is the lion, buffalo, leopard, elephant and rhino. The term was originally used by hunters to refer to the most difficult and dangerous animals to hunt by foot, but is now commonly employed by marketing people as a slogan to entice tourists to game reserves and national parks. Many a word has been written about the Big Five, “whether the biggest, the fiercest, or most formidable, these animals are the ones that have the power to remind us of our insignificance in the face of the true kings of the savannas.” William Taylor et al (1999). The adrenalin-rush of the old days of hunting has been replaced by the thrill of spotting and snapping. If you see a lion with blood on its mouth, leopard cubs playing and a baby elephant being caressed by its mother, all on one trip, you’ve hit the jackpot. Trouble is the Big Five don’t all live naturally in the same part of Africa and so to see them all together, one needs to go to an enclosed park or reserve, where they have been introduced into man-managed and electric-fenced environments. 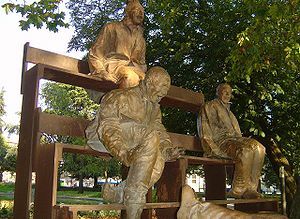 We went to one of these places and experienced the whole package, with hours sat on an open-topped truck as the sun rose and set and then more hours afterwards by the roaring fire, listening to war stories and unique anecdotes being regaled by fellow travelers and guides. It was only then that I began to really understand the immense pleasure and specialness of being in the presence of such great animals. The ultimate safari is going to the vast savannas of East Africa, such as the Serengeti, and camping out for weeks on end, looking out for the herds in their naturalness, and if lucky, spot a lion mauling the soft parts of a freshly caught springbok. We, however, opted for Safari Lite and spent a couple of days and nights at a luxury lodge that had been built as an integral part of the reserve half way along the Garden Route. In one of its ads, it claims you can see all five in a malaria-free environment. That whetted my appetite and reassured me – being a bit of a wus these days. But they had substituted the leopards with cheetahs while also adding a few giraffes (which don’t normally live there) to the mix, giving us a bonus: five plus one. 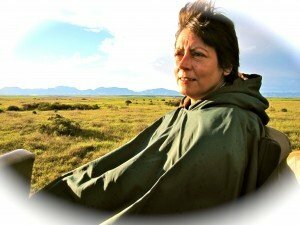 On our first foray into the wild we donned big green capes – not for camouflage but because it was raining and windy (it being the start of winter) and we being out in the open for a few hours for each safari stint. We plonked ourselves in the three-tiered seats at the back of the truck that looked a bit like one of Juan Muñoz’s bleacher sculptures. Six of these strange looking trucks then set off in all directions, each with their own guide/driver at the realm, barking out safety instructions to us and what to look for. 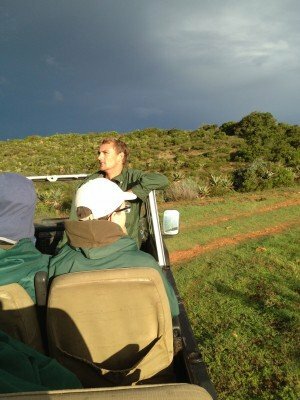 Our guide, who looked like a young version of Clint Eastwood, drove us across the terrain in search of rhinos. And it did not take long before he spotted three in a creek. He stopped the truck and turned the engine off so we could see them in all their glory. Instantly and in unison, we raised our telephoto lenses and began shooting image after image of them lolling around, eating and playing with each other, while he bellowed factoid after anecdote about this one of the five. Once satiated, we went off in search of the giraffes. We were not disappointed. One proud mother stood high, shielding her 4 day-old baby. By this point we were incandescent. Our cameras went into overdrive – click, click, click. Being so close to animal greatness – however semi-tame – was special. And then more feasting followed; with many sightings of other wildlife, including zebras, impalas, springboks, elands, bonteboks and others. We learned the difference between many kinds of deer and antelope. Seeing a giraffe eating shrubs with its neck bent over was strange. But when it stretched it back up, stood tall, and started chewing and regurgitating against the sunlit backdrop, it was breathtaking. Our guide reassured us that these giraffes had adapted well to their new habitat. The evidence, he said, was in them having babies – the female we spotted had just given birth to one that looked tiny in comparison and awfully cute. 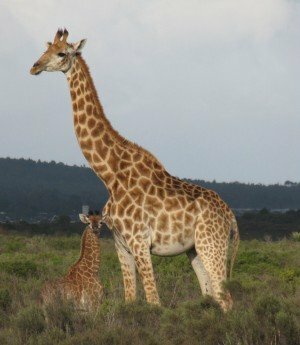 But the difference between eating acacia trees and local Fynbos shrubs is that the leaves on a tree start to taste very bitter after about 10 minutes, causing the giraffe to move onto the next one, whereas the shrubs don’t. The bitter leaf taste is caused by the tree releasing tannins to defend itself from being all gobbled up. When it gets too bitter the giraffe moves on to the next tree and so on. This way the trees can survive. The indigenous shrubs, on the other hand, have not had giraffes in their midst and so have not adapted to releasing tannin to defend themselves. Our minds wondered about how such man-managed ecosystems were able to keep balanced, given these non-adaptations between animal and plant. The trick is in the fencing, the feeding and the numbers. Keeping the animals apart stops them killing each other, which is what they do in the wild but is expensive and messes up the balance in a small reserve. Rhinos and elephants need enormous quantities of food and so are fed with plant fodder brought in from elsewhere. Our guide was full of juicy pieces of knowledge that helped up build up a complex picture of how a game reserve works as we zig-zagged our way around the many tracks. He even answered, with a Clint-like seriousness, the barrage of one-liners one of our fellow visitors kept asking him about each new animal we saw: what they tasted like and had he ever tasted them. We found out that zebra tastes like cow and rhino and giraffe meat are simply inedible, especially if they are full of testosterone. Our final encounter was with the lion. As our fellow visitor began asking what lion tasted like, it stood up, looked over at our parked truck and took a mighty pounce towards us. Our guide momentarily lost his Clint-eyed look and revved his vehicle at full pelt. The diesel fumes started pouring out the back of the truck and the wheels started spinning in the mud, as he tried to race up the hill with the lion charging towards us. We really felt the adrenalin then – not least because we were nearest the lion and were totally defenseless. But the smell and sheer quantity of the fumes were bitter enough to stop the lion in its tracks. 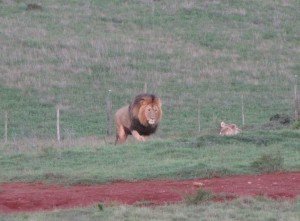 It then just roared at us as we drove towards the automatic gates. The lion story will stay with us all, no doubt embellished a little more each time of its telling. But that is the essence of the safari lite experience, just like the memories of a hunt – being able to regale and recapture the beauty and fear of such magical moments.